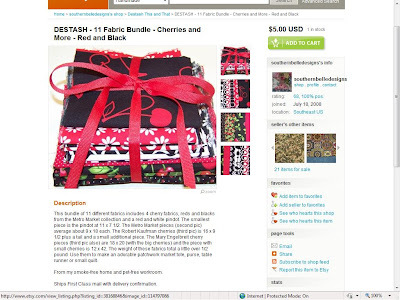 If you've got fabric scraps and don't know what to do with them, this blog post is perfect for you because it will teach you how presentation will separate your scrap listing from the rest. Many of you, like myself, frequent Etsy on a daily basis; if not to monetize, solely to be a shopper. I double as both. 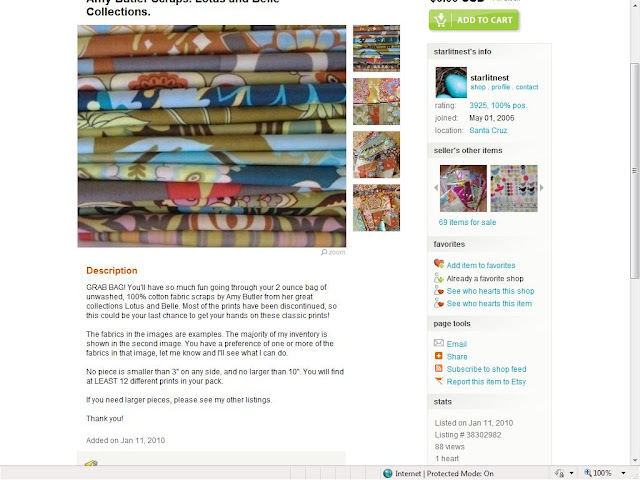 I buy scraps for my crafts and turn around and sell my creations furthermore supporting the true nature of Etsy. What I have found is that Etsy is probably the best spot to find quality designer scraps. But what I've noticed is that some sell while others stay listed for a good while without one sale (to my knowledge). Over the past couple months, I have examined the scraps that I have picked as my favorites and the ones that I choose to just leave alone. The main thing that separates scraps that I buy from scraps that will stay listed are presentation. So, lets start from the beginning. You've been sewing for a few weeks and have accumulated scraps that your probably not going to ever use. What to do now? You've got a few options. You can throw them away. However, that's not really the best option because that would be plain wasteful. You could also give them away. That would be generous. But, not all of us want to be THAT generous. So you decide, "hey, why not sell them!" So you decide to sell your scraps. Whether their designer or not, you've got to make your presentation perfect so that it can attract some buyers. If you follow these steps, your presentation will be spot on. My example photos are going to come from a Etsy seller who, just today, I recieved fabric scraps (or she described them LEFTOVERS). Southern Belle Designs is a store that specializes quilts and totes. Use her layout as a guideline. 1. Have a photo shoot. Have a photo shoot. Take lots of pictures at different angles that you can use. Don't just settle for one picture and call it a day. plan on having at least 5 good pictures that you can post on Etsy (try to use all 5 photos allowed per post). take pictures of how much fabric the buyer is going to get. Pre-bag the fabric if you have to. But make sure your able to show how much the buyer is going to get so they have an idea. A lot of times, the sellers just show pictures of the fabric itself thrown in one big scrap pile. DO NOT DO THIS. it doesn't look organized. Put it in a bag. But make sure that if it's bagged, you leave a note at the bottom of the post saying "ACTUAL FABRIC MAY VARY FROM PHOTO ABOVE." 2. Give an ACCURATE description of what the buyer is going to get. 1. 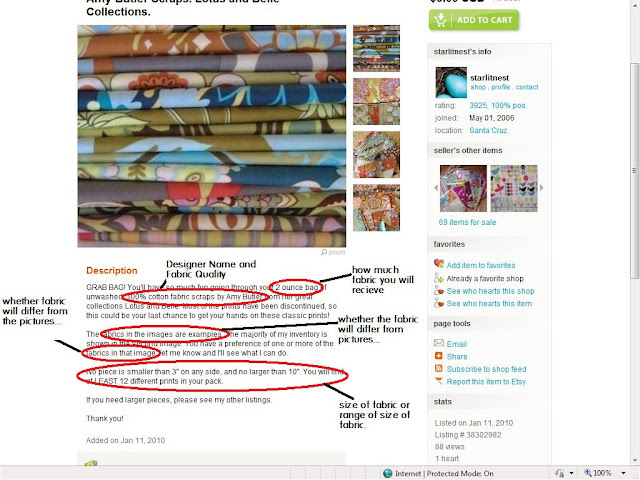 Fabric Designer: "The fabric scrap pack includes Amy Butler, Micheal Miller, etc." 2. Fabric Amount: "You will recieve approximately 8 oz of fabric the equivalent of 1 yards of fabric." 3. Type of Cut: "The fabric will be cut in 5'' squares" or "Most of the fabric is irregular shaped." 4. Delivery Container: "The fabric will be packaged in celophane" or "The fabric is packaged as seen above." Include ALL four of those elements. I can't tell you how many times I've not clicked on a listing because the fabric looked thrown together. If you fold the fabric or at least take a shot of the fabric folded neatly, this looks a lot better than a whole bunch of scraps thrown on a table. Although you may have listed in the description "Fabric may vary from pictures," show pictures of fabric that they will most definitely get in the package. You can put "SOME fabric may vary from photos depending on studio scraps remaining." I know that a lot of people bag it in celophane. Why not tie a ribbon around it and include your card. Tie twine. Southern Belle Designs used a ribbon and packaged it in tissue paper when she mailed it to me. That was GREAT! I felt really special when I got this and left her good feedback because it was excellent. Take a look at the fabric as it arrived from Southern Belle Designs. Thank you for featuring me! 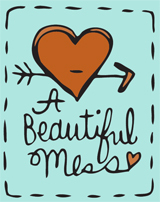 I agree, the scraps I've purchased in the past that came all crumpled up in a box was not very pretty or fun to look through. I had to iron everything. I think the seller believes it "looks" like more fabric when it's all crumpled...??? Thanks for the compliments and promoting my etsy shop! I need to get more scraps, um . . . leftovers listed!